Researchers have built a three-dimensional map of the anthrax toxin that may explain how it efficiently transfers its lethal components into the cytoplasm of infected cells. The study, “Structure of anthrax lethal toxin prepore complex suggests a pathway for efficient cell entry,” which will be published online September 26 ahead of print in The Journal of General Physiology, suggests that the bacterial protein acts as a “conveyer belt” that allows toxic enzymes to continuously stream across cell membranes. During anthrax infections, the bacterium Bacillus anthracis secretes a toxin consisting of two related enzymes named lethal factor (LF) and edema factor (EF) and a third protein called protective antigen (PA). The three proteins bind to each other and are engulfed into the endosomes of host cells. Seven to eight PA proteins then form a pore in the endosomal membrane, allowing LF and EF to translocate into the cytoplasm where they can damage, and ultimately kill, the host cell. To pass through the pore, however, LF and EF must unfold in the endosomal lumen before refolding into their active conformations in the cytoplasm. A team of researchers led by Isabelle Rouiller of McGill University in Montreal and Robert Liddington of the Sanford Burnham Prebys Medical Discovery Institute in La Jolla used cryo-electron microscopy to build a three-dimensional map of the “prepore” complex formed by PA and LF just before the translocation process begins. The map showed seven PA proteins surrounding a narrow pore, with three LF molecules perched at the rim, ready to be translocated. As well as binding to the PA subunits, each LF molecule also bound to its clockwise neighbor. 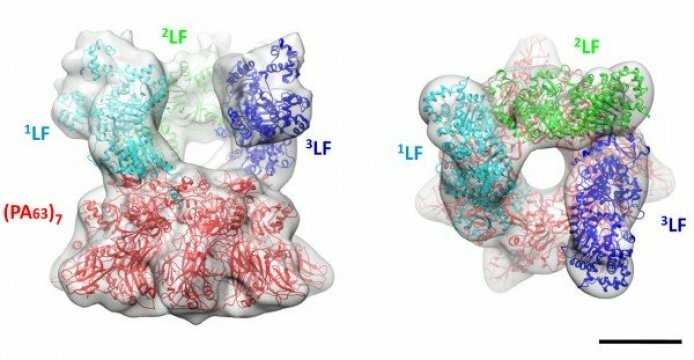 The researchers think that these inter-LF interactions may help to hold the toxic enzymes in place and prevent them from unfolding prematurely. Web Source: The Rockefeller University Press.